This sculpted head was once part of the furnishings of an altar. In Benin the human head is considered a separate entity with a spiritual function. 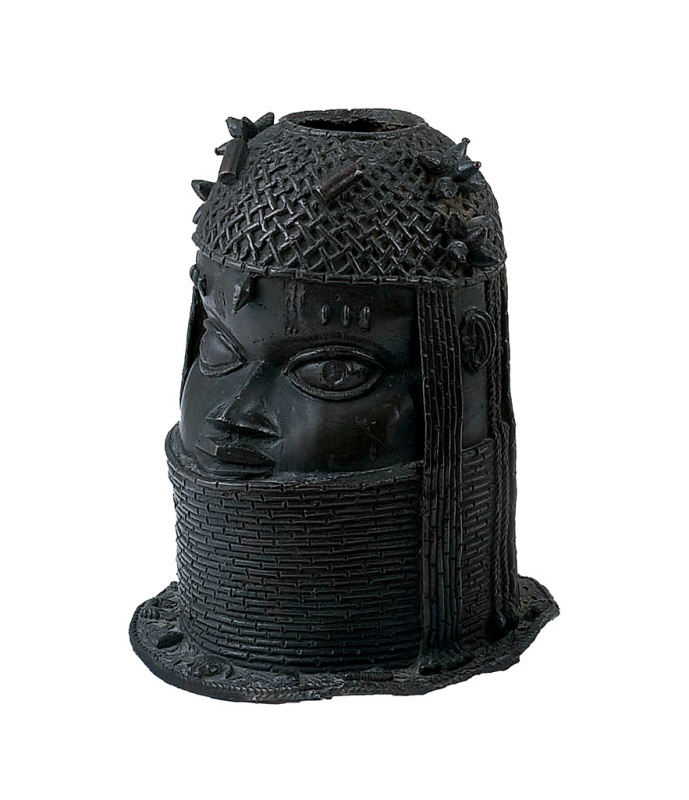 The ehi, a mystical force located in the head, is a gift from Osanobua, the High God, and his eldest son, Olokun, with whom each individual confers to choose his or her life goals before rebirth into the mortal world. Because these goals are forgotten after birth, the ehi resides within the head throughout one’s lifetime, keeping track of progress and offering subtle guidance. Crowned heads in bronze such as this were once placed on ancestral shrines in the palace of the oba, or king, to commemorate past rulers. From the late 1600s onward, these heavy commemorative sculptures served as brightly polished metal pedestals for large elephant tusks, which by the middle of the 1700s were covered with elaborately carved designs. Whether the crowned heads were also portraits of specific kings has not yet been established. This head was probably placed in a royal ancestral shrine during the last part of the 1700s to support a heavy tusk. It is believed that early in Benin’s present dynasty, before the art of casting heads by the lost-wax method was perfected, the Iguneronmwon made commemorative terra-cotta heads for the ancestral altars of Benin’s kings. Although these were replaced after the 1500s by sculptured heads in metal, the bronze casting lineages continued to create terracotta heads for their guild altars.